our perfectly imperfect life: Happy, happy birthday! Four years ago today, Payton entered the world looking a tid bit dusky. Well, she actually was more than a tid bit dusky, but we'll keep it at that. The poor thing ... it breaks my heart to see this picture of her just after she was born. I remember saying, "I don't think she is supposed to be this color." Seconds later, a NICU team came flying through the doors and whisked Payton over to the side of the room. They were giving her blow by oxygen, which was less than sufficient. They took her away and the next thing I remember is being wheeled into the NICU to see my baby girl. They rolled me up next to her isolette ... and there she lay under an oxy hood with cords everywhere. Uh ... things were not supposed to happen this way. A nurse removed Payton's oxy hood so that I could see her face and that is when it hit me. She has Down syndrome. Look at her eyes. It is so obvious. I didn't say anything to anyone about my suspicions. Not even my husband. And nobody had said anything to me about their suspicions. 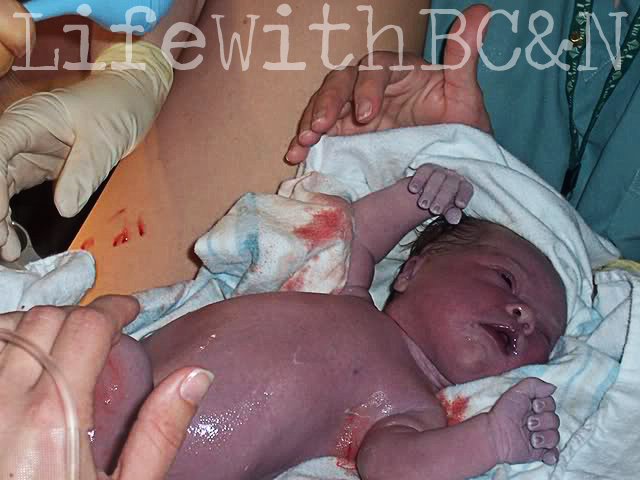 It turned out our baby girl had to stay in the NICU, as she could not breathe on her own. Her red blood cell count was also through the roof and she had two small heart defects ... among other things. The doctors finally let us in on their suspicions and that is when our world came crashing down. I wasn't sure that I even wanted to see my baby. The hospital social worker had brought me some out dated information on Down syndrome ... one of which was titled How to Breastfeed the Down Syndrome Child. I remember feeling so empty when I read that. I mean ... the Down Syndrome Child? Was my baby girl not even a person? My emotions were all over the place. Thank God it did not take me long to realize that Down syndrome or not, this was my child. This was my gift from God and dangnabbit, I wanted to see her. I would later come to find out that the exact feelings I initially had are very common. Is it hard for me to admit now? Sure it is. But I just didn't know. I was not educated and I had no idea what sort of gift had just fallen in my lap. A gift that has taught me more things in her four years of life than I have learned my entire life. A gift that has allowed me to appreciate the small things in life. A gift that has given me more compassion than I know what to do with. A gift that I am so deeply in love with, that I am not sure I could live without. Happy 4th Birthday, Payton. Happy, happy birthday! I cannot believe it was 2 years ago that we were down in VA for your 2nd Birthday and I remember watching your video with your family getting all emotional and feeling embarrassed to cry in front of them...We love you so much Payton. We miss you and hope to see you soon! Have an incredible Birthday Beautiful Girl, you are soooo stinkin' special! HUGS and LOVE! Awww...what a sweet story! She is a cutie! Happy Birthday Payton! Happy, happy 4th birthday, Payton! You and your mommy have come a long way! Gosh, she's such a cutie!!! Hope it's a great, fun-filled day surrounded by your beautiful family. omg, bethany, I am sooo tearing up and crying out loud right now! Payton is such a gift to all of us! We love you guys so much! Happy Birthday sweet Payton!!!!!!!!! Happy Birthday, Beautiful Payton! Her birth story is so well-written! Hope today is a wonderful day! Happy Birthday Payton. What a beautiful story, Bethany! Happy 4th Birthday Payton:) Bethany, she is absolutely beautiful. Isn't it wonderful to celebrate such a precious gift when it's not even your birthday?! Enjoy the day! Happy Birthday Payton!! She is such a beautiful little girl! Brought tears to my eyes. What an adorable picture, she is beautiful! Happy Birthday Payton! Beautiful post, Momma! Happy Birthday Payton - the cutest 4 year old I know. Yea Payton! Yea Payton's Mommy! You are both very lucky :)! great story, sounds very familiar! Happy 4th brithday to Payton and YOU! A VERY Happy Birthday from another Birthday Girl. She is adorable. Happy Birthday, sweet Payton! You may never realize this, but when I first saw your picture on Downsyn after Lucy was born, you made me feel so hopeful. It was your Mama's siggy pic at the time, and it was you and Mason with sunglasses on. You were laughing. So was Mason. Just like any little girl with her big brother. I knew that I was going to be ok. I knew that Lucy was going to be even better than ok. It's been great getting to know you and your family. Happy, happy birthday. What a beautiful gift you were given that day. Wonderful post, Happy birthday sweet girl! Happy Birthday Payton!! We think you are just the cutest 4 yr old!! That surely took me back to my first moments, too. Too bad we didn't know then what joy our girls would bring us! Happy Four Years, Bethany, and Happy Birthday, Chicky! I truly understand the gift of Down syndrome, twice. You are a blessed mommy to have Payton as your Big Girl 4 year old! Payton is also blessed to have such an amazing mommy. Thank You for sharing your wonderful journey with us. I love to follow along, like everyday. Happy Birthday Payton, U R A QT! Oh my. She sure was blue/purple. Didn't realize she and Carly have bday's only a few day apart. Happy Birthday Payton. You sure are a beauty! What a great post! Happy Birthday Payton!! I hope she had a great birthday! You never forget the details of your child's birth. 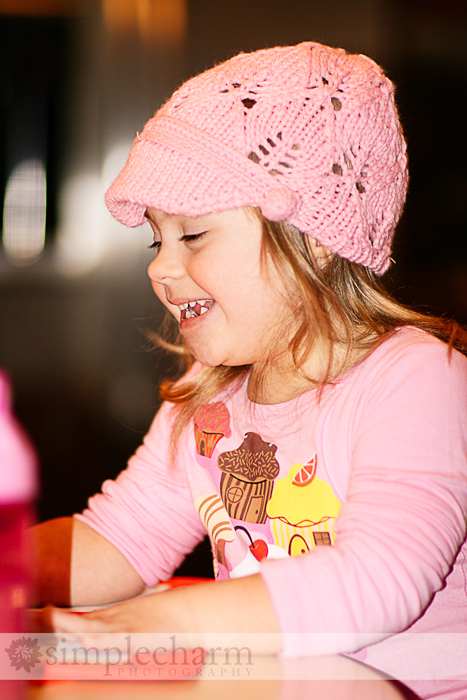 And as a mom of an amazing young lady with Down Syndrome, I understand all the emotions. Payton is quite the cutie! Happy Happy Birthday little teacher! I LOVED reading this post, Bethany! What a precious precious child Payton is! Happy Birthday, Payton!! Happy 4th Birthday Miss Payton!! Hope you had a great day!! Thank you for sharing Bethany, as soon as you started your story, I was wondering if you knew before she ws born that she had DS, it made me cry to hear you explain the transformation a Mom's heart makes, so quick and so complete from shock and anger to complete love and blessings, what a gift she is. You probably already have a copy of the book Gifts, but for anyone who would like to win a copy, today is the last day of my contest to win. Oh that color, I remember it so well. Scary! Happy Birthday big girl! Hope you had a great day. felicidades Payton! i still remember when i saw the first pictures of her, i knew she was special, and also knew your family was special, and after 4 years reading you i know you are. anyway, muchas felicidades!!! my best wishes, and we send you lots of mexican hugs!! a happy belated 4th birthday to Payton...what a beautiful photo of her!